We can absolutely guarantee the cost estimation of the construction. Our sophisticated measuring and accounting systems working together with the experience of the project managers and engineers create a cost estimation which we can guarantee to be correct. When we give you a price to construct a project – that is the price you will pay. Our accounting systems create transparency which enables the client to see exactly where each cent is allocated. We can absolutely guarantee the implementation schedule. Europlan projects are famous for being on time – or before time! At the start of every project our experienced project managers and engineers review your planned project and create a construction schedule. This schedule is then used to make a Gantt chart which is followed very closely throughout the construction project. Our experience has given us the ability to precisely know the time of completion of your project and therefore as a team, we can guarantee the completion date. We are never late and strive to get you to your dreams before your due date! the process giving you the feeling of complete control over your project. We can provide you with detailed plans at the end of the construction . At the end of your construction we provide you with a detailed “As Built Plans” which show the completed layout of the project. These plans help you to identify where everything is allocated in your project. At the end of your project we will provide you with a detailed “Home Owner’s Guide” which includes everything you need to know about the maintenance and the operation of your home. This book gives you for example details of everyone who worked on the project, how to use the appliances in the home and how to maintain swimming pools etc. This book is highly informative and our clients have found it to be extremely beneficial. 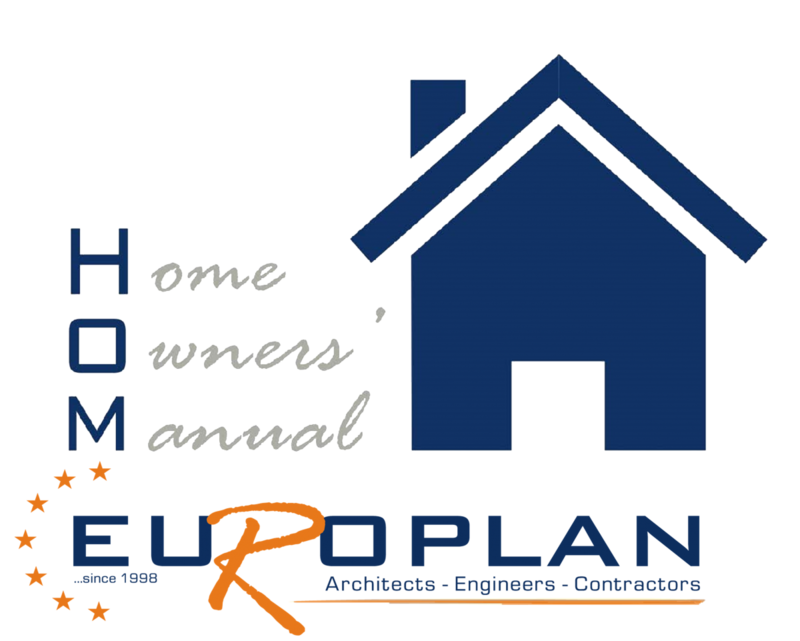 Of course Europlan is always on hand to help our clients if the need arises but we find the book helps to gives control to the client and this is greatly beneficial for the new owners. We give a 5 year written guarantee of our work. All our work comes with a 5 year guarantee. All subcontractors who work with Europlan sign a written guarantee ensuring their work for a period of 5 years. During that time, if any problem arises, our team will gladly fix the problem at our own cost. We believe in the quality of our work and the people who work for us therefore we show with pride the 5 year guarantee which we provide. We oversee daily all of our projects to ensure the safety and quality of our work. All of our projects are supervised by qualified engineers who report directly to the project manager. Your project is always in safe hands and any question can be raised to the supervisor working on your project. They are there to ensure that you get the high quality finish that comes as standard with a Europlan project. We handle all of the paperwork, leaving you with the enjoyment of the final product. We all know that Greece is famous for its bureaucracy which can be extremely frustrating if you don’t know the system. We know that many of our clients are not native to Greece and therefore can find the systems very daunting indeed. Our team at Europlan has forged well established relationships with all the local authorities and agencies which means there is less time wasted on paperwork and more time to spend on getting the job done. We are an internationally award winning company based on quality, technology, environmental efficiency and detail of our constructions. Awards in London and received numerous awards for our Architectural abilities. We have been named Best Architecture in Greece for many years running and in 2015 we were named Best Architecture in Europe for one of our properties. We are fiercely proud of our awards which show that we are an internationally recognized company whose standards are on par with the international community. You can trust that our results will be of award winning standards! We support the local economy wherever we operate. We believe that it is essential when becoming a successful company that we support the community that has supported us. With every project we aim to use local supplies and craftsmen to help support our local economy. We don’t however, compromise on competition and we aim to educate the local community on what is a competitive price. When you choose Europlan you know that you are supporting the country that we all love and helping the economy to improve.